Cables that do the job of more than one are a noble breed of accessory, and Innergie’s Magic Cable Duo cuts down on the need for both multiple cables and external adapters. Here are my impressions of Innergie’s versatile iOS (s aapl) device charging accessory after a week’s use. Apple’s own dock connector-to-USB charging cable is pretty thin, as far as USB cables go. That definitely helps when you’re rolling it up and stuffing it in a pocket, but it doesn’t necessarily do anything for durability. The Innergie Magic Cable is much thicker — about twice the diameter, I’d say — and definitely feels more solid. It seems to me like an animal’s tooth or errant blade would have to do a lot more damage to cause a fatal breach. The feeling of durability extends to the point of connection between the cable itself and its USB tips, too. This is a notoriously weak point on Apple’s own charging cables, but Innergie seems to have gone out of its way to buttress and reinforce that weak point, which should do wonders for the cable’s longevity. The only downside of the physical design of the Magic Cable vs. Apple’s own is in terms of length. 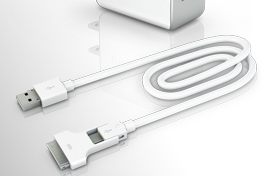 The Innergie cable is just 31 inches (79 cm) long, while the Apple dock-to-USB cable is 38 inches (96.5 cm). If you find the official version short, you’ll be very disappointed in the Innergie, in other words. The key appeal of the Magic Cable Duo is its sliding, in-line interchangeable dock connector head, which fits over the cable’s micro USB male component. I’m happy to report that this part of the cable impresses; repeatedly pulling the dock connector part on and off of the micro USB head showed no signs of stressing or breaking the plastic that holds it in place. I was also intentionally being a little rough with it, so with standard use (i.e. switching out the heads once every day or so) it should more than meet expectations. The Magic Duo seems more than able to charge your iOS devices at a normal rate. I tested it with my iPad 2 and the standard iPad 10W charging adapter, and found that the Innergie cable charged the iPad just as much as the Apple cable during a 15-minute period. Plus, the Magic Cable Duo also worked with the iPhone 4S, the Samsung Galaxy S II, and the BlackBerry Curve 9300 (s rimm), although the BlackBerry did required use of a BB-designated charging adapter. In the end, the Magic Cable Duo is a smart, inexpensive ($19.99) upgrade that makes plenty of sense for gadget addicts with lots of devices that need charging. It’s also much less likely to get lost than Apple’s own diminutive iPhone Micro USB Adapter, which has a tendency to get lost. Plus, Innergie includes a fixed velcro cable wrap to make sure it’s easy to pack. So long as you don’t mind the trade-off in cable length, it’s a great way to spend some of that Christmas money. I got one too, and have the same comment — it’s too bad it didn’t come with an extension cable in the same colour. One other nice feature, were it possible, would be to be able to use 2 or all 3 of the plugs at the same time.